Seriously? Why would anyone write another post on keyword research? The reason is simple; times change…It’s 2019. The sheer amount of data and tools now available, not to mention the increased need to understand contributing factors such as latent semantic indexing (LSI) and the potential effects of RankBrain, change the landscape of information. Not to mention the fact that Google has now taken away more of our data, rendering many of the tools on the market (whom relied on scraping Google’s Keyword Planner) useless. Then on top of that, with Google’s various signaling algorithms and all this data in near constant flux – I thought it was a reasonable time to revisit what I still believe to be, the most important aspect of SEO. UPDATE: This post has been updated to reflect Google’s change to free use of keyword planner and makes use of alternative keyword research tools to fetch search volume data and fill in holes. I also wrote a review of how to rank for keyword tool. 95% of those pages will say the same thing; use keyword planner, sort by volume, use some other tool to get a competitiveness or difficulty score, blah blah. Most of the processes are near identical, and leave a lot of stones unturned. Not to mention one near-constant, gaping hole; a process to select and prioritize keywords based on a realistic timeline. This post is going to run through my current process. Which has bits and pieces from many others, but will also have you mine a considerable amount of additional competitive metrics to make real, informed decisions in terms of which keywords you should be targeting – and more so, how to create a priority list you can actually attack. Start with common sense, and then use data to validate your ideas. Use websites ranking well with large relevant footprints to expand your keyword list. Grab existing footprint data (*only valid for existing websites). Expand your list of seed terms to include tangential and related topics and concepts. Retrieve search volume and commercial value data. Sort by search volume and use negative keywords to filter down your list to core terms. Leverage existing SERP’s to get a list of all your competitors at the keyword-level. Mine directional competitive metrics for all SERP competitors. Build multi-layer filters to identify easy wins, high value targets, and create timelines for ranking. So first things first, you need to turn on your brain and think for a few minutes. Start by thinking of just one general phrase that describes the topic or concept you’re doing keyword research for; and make it a phrase, not a word. It can be 2, 3, or 4 words… as long as it’s not just one word. The term “keyword” is actually a bit misleading.. cause phrases are keywords.. as least the most qualified and most valuable ones. Now it’s time to get some data to validate your idea. *IF* you have an SEMRush account (like I do – and you probably should if you’re serious about SEO), then you can save yourself some serious time by starting there – so if you do – type your seed keyword into the SEMRush box below and hit enter. Now let’s run through what you’re looking at and how to make use of all this glorious data. ^you’ll quickly notice that the free version only gives you access to 10 results, but for the purposes of my process right now – that’s OK.
and grab and export from there too. The logic for using keyword planner, and getting the most out of it, is the same as SEMRush – you just get a bit way less data – especially now since Google requires you to be running active bids on AdWords to get the data you’re after. TIP: Click into the “keyword options” panel and check the box for “Only show ideas closely related to my search terms” and click Save. using these filters can provide all sorts of incredibly important directional data both for SEO but also for paid search. First things first, let’s clean up this mess. Regardless of which route you took; free with keyword planner, paid with SEMRush (or term, volume, and competitiveness data out of pretty much any other keyword tool), your file has a bunch of fluff data that is not going to help at this phase of the process – so let’s go ahead and clear that out. First delete the 2 columns we don’t need; Number of Results and Trends. There may be some instances where you would want to look at these but for my process at this point you won’t need them. Now it’s time to stack a couple filters to lean on data to do more of the work for us. So select Row 1, then click the “Data” tab, and then the “Filter” tab. First sort Column B (Search Volume) from largest to smallest, and then filter column D (CPC) and uncheck the boxes next to anything under $1.00. Why filter out keywords with less than $1 CPC? I would consider keywords related to keyword research to be what I would consider a mature SERP, in that the demand is stable and there’s clearly terms in this vertical that have commercial intent – we can cut out some of the junk by removing terms that don’t have enough commercial intent to warrant at least a $1 per click price. Yes, it’s possible these terms are great top of funnel terms where visitors are gathering information to start their buyer journey – but today we’re focusing on the money. Then just like with SEMRush, select row 1 > go to Data > Filter. Sort by your Column B (Avg. Monthly Search Volume) and then filter out the “Suggested bid” column for any bids under $1.00. What you’re left with is a handful of keyword phrases, monthly search volume, AdWords competition, and Google’s suggested cost per click bid price. IF you’re fortunate enough to have this data from running an AdWords campaign, or you did your research recently enough that it’s still relevant (i.e. within the past 30 days if your business isn’t hyper-seasonal) we can pick up the process of making sense of these numbers. First you’re going to want to slice cull this list down to be a representative list of seed terms. I prefer to do this by abstracting out the root term, and building a list of modifiers. So as a quick aside, a modifier is a word or phrase that is appended or prepended to your root seed keyword phrase that changes or enhances it’s meaning. Even though there are 15 keywords in the list shown in the snapshot, those 8 terms are the only modifiers – making sense? 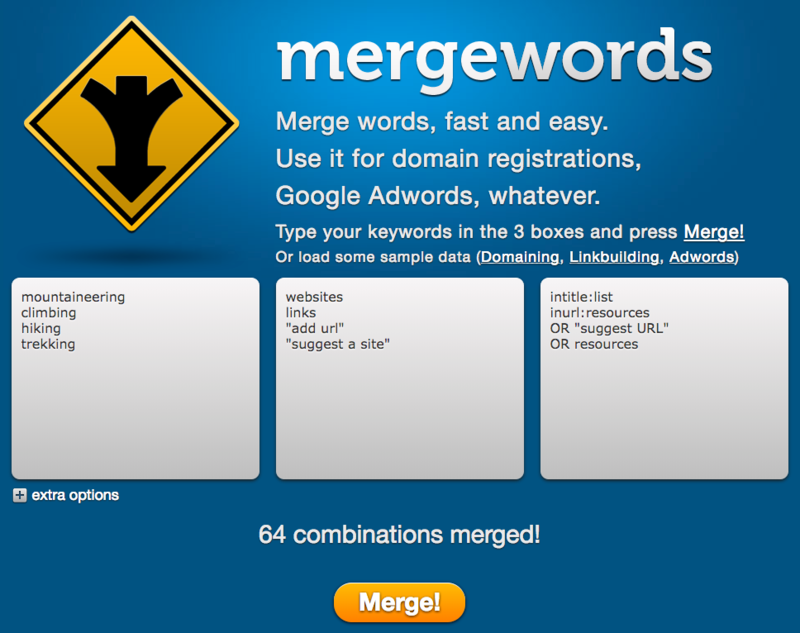 What you can do from here (if it makes sense for your website and content vertical – which I’ll come back to in a moment), is to use a tool like mergewords.com to quickly blow out your list of seed permutations. (H/T to Ollie Hayman for the find). Using multipliers is especially useful for working up long-tail phrases to be included in body copy for things like recipes, business processes, and other topics where the words tend to be the same but the order can vary significantly depending on the writer. Tools like ubersuggest still afford great uses for expanding on initial lists of seed terms. and BONUS now also includes monthly search volume, though if I’m being honest I’m not sure where they’re getting it from – I sincerely doubt they’re maintaining their own index (no hard feelings ubersuggest). There’s also a free tool or two that will scrape many of the sources that people use to search everyday (Google, YouTube, Ebay, Amazon, the App Store, etc.) and provide you with large lists of keyword ideas relevant to your core seed term. From there though it’s still up to you to run through the painstaking process of getting search volume and competitive metrics for all those words. Gone are the days of just picking keywords because of high search volume or low competition. The modern customer journey requires a deep understanding of what searchers are expecting to see when they query google seeking answers. This means classifying modifiers into buckets that allow you to infer the intent behind the words. Let me explain what you’re looking at in the above diagram. The stages of the traditional conversion funnel are AIDA, and as I mentioned these align rather nicely with the 4 top-level buckets of search intent. As searchers modify their keywords to include intent modifiers, the desire of the searcher moves further down the conversion funnel. The practical application of this is that as keywords get bigger, i.e. include more words, they become more “qualified” in terms of indicating where the searcher is at in the above conversion funnel. It’s projected that keywords containing 3 or more terms (which are commonly referred to as longtail keywords) make up as much as 70% of all searches, and convert on average at a 4-5x higher rate. Single word keywords, i.e. shoes, shorts, pants, CRM, etc. Understanding searchers implied intent by tagging your keywords for which stage of the buying funnel they represent, will allow you to develop better content to serve their expectations. This means you stand a better chance at providing the information they’re looking for when they’re seeking it and have the opportunity to move them further down the funnel towards a transaction. We’ll come back to this a bit later in the post. Existing websites inherently have a leg up in the keyword research process – unless you’ve been blocking all robots from crawling and indexing the pages on your site, you will be able to get some data on how your site is currently categorized from a contextual relevance stand-point. My favorite way to do this is to grab your homepage URL and head back over to SEMRush (yes again). They have a cool feature that will show you not only the keywords your site is currently ranking for, but the other sites and URL’s that are ranking, the number of keywords you share, and give you the opportunity to dive into those overlap sets to get more insights. So you have an existing website, hopefully if you’re reading this since you’re interested in SEO – you understand how critical it is to have as much data as possible for your website. So naturally it makes sense to start with keywords you already have visibility for. The screenshot above is taken directly out of Google Analytics (GA) with Google Search Console (GSC) hooked up. Once you’ve verified your site with GSC and authenticated your account within GA you get all this lovely impression, CTR, and average position data flowing in. GA is wonderful for a lot of reasons, but perhaps one of the greatest is that it’s still one place where greedy Google doesn’t handcuff all your data – so you can export all of this lovely data showing your current term relevancy out and into a useable format; a spreadsheet. You can export for Excel, CSV, TSV, or even direct to Google Sheets. Now that you have all this great data from all these sources – you’re ready to use an intelligence tool to fetch all of your competitive data. My go to for this is still TermExplorer, though there are some caveats now thanks to Google’s recent Keyword Planner changes. So with that let’s run a bulk keyword job in TermExplorer (this can be done with a free account) – just know you’ll need to get the search volume out of something like SEMRush (or one of the other *very* few data sources that maintains their own keyword index). Let that run in the background (it’s going to take a little while) and in the meantime take that seed list and let’s go get search volume data for these keywords – so I’m going to head back to SEMRush. If you are someone who still refuses to pay for data, you can stop here – good luck. This next part is where TermExplorer actually becomes worth paying for. YES I promise this is extremely valuable, and I’m going to show you exactly why. Notice anything strange? Yeah… all that keyword search volume is wrong. However, all the rest of this data is not only accurate, but extremely helpful. What TermExplorer’s analyzer does is not only goes out and scrapes all the ranking URL’s on the first page SERP, but then it goes and scrapes each of those URL’s and pulls all their link data. So even though at first it seems like there are loads of duplicate results – LOOK CLOSER – instead it’s displaying all the URL’s ranking on the first page for each keyword. What About Getting Accurate Search Volume Data? Well, we’ll have to do something about that. Good news is that now that we’re in Google Sheets, we can use something like SEMRush’s API to fill in the blank that we will soon have. So first step – delete all of the data out of Column C (Average Monthly Searches). Next add in a new column to the left of Column C, and name this Column “API Call” (just for reference). Next it’s time to go fetch the data we’ll need from SEMRush. I promise this sounds scarier than it is. In order to use that script you’ll need to grab your SEMRush API Key and then replace the section where I have “YourSEMRushAPIKeyGoesHere” with your key (kind of obvious right?). You should see it render “Loading…” for a few seconds and then pull back the search volume and populate the previously empty cell in Column D.
Now comes the easy (and fun) part – simply grab the bottom right-hand corner of that cell and drag it down to the bottom of your file (or if you prefer copy the cell, scroll all the way to the bottom of the Column, hold shift and paste). Once all of you data has finished populating via the API (and depending on how many rows of data you’re requesting this could take several minutes) you will now want to lock all that data into your file so it’s no longer dynamic. Now Copy all the data from Column D and then Paste Special > Values. Remember that time we talked about search intent and how important it is? Now it’s time to put it to put the concept to work to help you prioritize your keywords and come up with an initial target list. Sentinel is a keyword intelligence tool me and my team created to help automatically take all the data you just gathered, automatically tag for intent based on your specific keyword vertical and the modifiers therein, and then automatically prioritize which keywords you should be going after based on rank potential. Better yet – it’s free. ALL the functionality is Free. There are paid tiers but only for massive amounts of data where there’s a cost to host all of it, otherwise – completely free for all the automatic keyword opportunity goodness. Regardless of how you get your search intent mapped to your keywords, once you have it baked into your keyword file there’s a few filters you can now use to find your opportunities. First turn on Column Filtering by selecting row 1 and going to Data > Filter. Now filter Page Links from lowest to highest and then using the filter on the search intent column remove the checkboxes for Informational and Navigational. You’re left with an ordered list of bottom of the funnel keywords with the least amount of links needed to crack rankings. To take this a step further you can additionally sort the words on page from Z to A (least to most) to then find even easier ranking opportunities as the amount of content needed will be the least among your keyword population. Pay attention to the number in Column A (“Position”) as this will show the rank potential you can realistically target for a given keyword based on hitting or exceeding the ranking heuristics in that row, i.e. words on page, keyword use in meta attributes, and link count. Can you see how you can start to glean immediately actionable information from this data? Another quick win is looking for pages ranking for keywords where the keyword is not being used in any of the meta attributes (title, domain, URL, or on-page content) – these can usually be cracked simply by standing up a basic page and targeting the keyword with the page title. Why is this process so valuable? One simple reason; it takes into considering rank potential – and to date, it’s the only keyword research process that accounts for the fact that you cannot and will not rank for all the keywords you want to. Now you have all the data you need to make directional decisions in terms of prioritizing your keyword lists and then mapping intent. If you still prefer to run through the entire process of building out what I call a keyword matrix using all the data I’ve discussed in this post, you may want to check out my course called Master Keyword Research which will take you through the exact steps to do this, or again – you could just use Sentinel. Love to see you blogging again with another epic keyword research post. Quick question – have you used Ahrefs’ keyword tool much? I’ve found their database much larger, faster, and better. I’ve actually cancelled my SEMrush subscription b/c Ahrefs covers it all. It doesn’t have the $$ values for sites which I miss, but that can be added with an extra step. I have actually used it a bit and would agree with you that it’s impressive. I didn’t realize they had their own keyword index and had assumed they were piping data from one of the other bigger players, whether SEMRush, Conductor, BrightEdge, SearchMetrics, etc. Guess I’ll have to take a deeper dive – thanks for the tip! Hey Nick – great guide! quite different stuff than I’ve read on Backlinko, etc. I usually start what I would call “edge-case keyword research” by looking at popular discussions, comments, and questions posted on forums and Quora. Another operation for more anecdotal, directional data is punching your queries into Google wrapped with quotation marks and seeing if other sites are targeting the same terms. Lastly, it may be worth checking out Google Trends to see if any of the terms are starting to show up, this is also a great way to get out in front of a vertical before the competition gets heavy and to cement your spot in the SERP’s as an early resource. Holy Moly! That is an amazing post. I love the fact that you can map to the buyers position in your funnel. This will give us a much clearer picture of our position, and make it easy to plan. I love the way you can isolate the low hanging fruit. You should see if you can get Brian Dean or Neil Patel to tweet this. There are SO MANY people out there that can use this for website planning, SEO campaigns, etc. I am going to use it to plan out in advance my next site – and target terms I know I can rank for right off the bat. The opportunities afforded from spending the time to map search intent to keywords and then design your site and conversion funnels around the content needed to support those buyer journeys is HUGE. Wow, what an amazingly info-packed and actionable article Nick, the sheer depth of keyword research in this process is not something I’ve ever seen before. A someone who until recently was an avid user of long tail pro (which has been hit HARD by Google’s recent update, plus a buggy launch of their new cloud product), I’ve been looking for good alternatives. I’ve tried kwfinder. which is decent enough, but I’ll be reading this post again carefully and trying out your suggestions. Thanks! Yes unfortunately the majority of keyword tools out there relied heavily on scraping KW Planner data as the source for their toolsets. I’ve heard good things about kwfinder and am definitely going to check it out – I was also very surprised to see that ubersuggest now has search volume.. though I am suspicious it it’s recent/accurate or if it’s just leftover from kw planner. thanks for your sharing! I’m a web designer in Sydney, I would say your suggestion especially for data collecting is really useful! This is a good explanation of how keyword research is done and thanks for showing the differences between to major tools Google keyword planner and SEMrush. Can you tell me what will be the good competition, search volume and suggested bid for a keyword. Hey Shiva – “good” is completely relative here; it’s going to depend entirely on what the upper and lower maximums are within your most relevant target keyword set. If you run through the process in the post it will get you a list of all the relevant terms in your vertical and help you figure out which ones should be going after and what the heuristics are you need to be hitting and exceeding to see results. Kevin – So glad you pointed that out, I actually forgot I had it installed but I LOVE it! If you don’t mind me asking – where do you get your data from? We get our data from the Keyword Planner. You’ve lost me… with free use being shutdown, and active bids needing to be placed to pull keyword-level (fresh) data – how? Just saw this comment now. The data comes from the Google Keyword Planner API – that is not being restricted. Thanks for the information. I’ve been using Semrush not so long and I’m still in the process of studying and navigating its functions. I guess, Semrush is the best tool to track down all the top keywords search by users as well as tracking down your competitor’s traffic and etc, too. Keywords has a big significance on promoting your sites so better to focus on this stuff. Do you remember me? I grabbed some helpful SEO tips for my “Expert’s tips” category. Glad I connect with you after a long time. You have well explained the details of keyword research, and yes, it is essential to select the profitable keywords and place them in the exact positions in the blog posts. I use Long Tail Pro Platinum version to perform the keyword research. It is really a nice tool. However, I would like to get the SEMRush paid version and I have already used its free trail, it was awesome. Thanks for your detailed post! Hey Nirmala – Of course! I have had some great experiences with LTP, but after the most recent update it seems to have also been pretty badly affected in terms of data – are you still able to get accurate keyword volume data? Hey Nick, thanks for an amazing and thorough article. Most articles about keyword research keeps repeating same things again and again. But to readers delight, this article highlights points like search volume trends (which are more than often neglected) are actually need to be considered while performing keyword research. Hey Adwait – Thanks for picking up on that, glad you enjoyed the post! Amazing keyword research Guide. I cannot read this type content in other blog. good work. I started using DeepMiner PRO few months ago and I am very happy with it. I can find good quality Long tail keywords that brings me good money from adsense. Awesome post. You changes my view to research keyword. I really like your methodology on keyword research and I will use it to improve this aspect of my SEO. Thank you for sharing! This is very detailed post about keyword research, I’ll make sure to mention you on my post about SEO techniques where I talk also for keyword research. Hey Nick, Great detailed information about keyword research. But have you noticed that the tool keyword multiplier is expired? Thanks a lot for the great article. However, I’m experiencing some issues with retrieving accurate search volume data. For instance, is extensive keyword research really this expensive and painstaking without Keyword Planner data? Or did I make a mistake in my process? First I compiled a list of approximately 10.000 keywords. Then I signed up for a Term Explorer Pro account ($97/month) and analysed 2000 keywords (weekly maximum). I still needed accurate search volume data for these 2000 keywords. So I signed up for an SEMrush Business Plan account ($399,95/month), since that’s the only plan with API access. Apparently, there are no API units included in the monthly price, so I had to pay another $50 for one million API units. After splashing out all that hard earned money I thought I was finally good to go. Then it turns out you can only import data for 50 cells per spreadsheet in Google Sheets. And it takes ages (almost an hour already) to generate the data. Most keywords just keep loading, others get an ‘Error 50: nothing found’ instead of ‘0’ as in your example spreadsheet. So, what am I doing wrong? Or is there a more (cost) efficient way? Any tips would be highly appreciated! First and foremost, it’s awesome to hear you’re serious about getting this all together and willing to make the investment (most aren’t). So I have experienced exactly what you’re going through with using the SEMRush API + Google Sheets, and after speaking with SEMRush support it seems their API “isn’t designed” to work seamlessly with Google Sheets :/ But all is not lost, I have actually had some decent success using Excel and the WEBSERVICE call to the API, which BuiltVisible wrote a great article on here. More recently I’ve also been using KeywordKeg to grab volume data and it’s been working well thus far. Thanks for the link! I will definitely check that out as well. However, I found a solution that works with SEMrush. I also contacted their support, and they confirmed that you always have to use text as input data instead of the cell reference. This way their tools will pick up the keywords directly and don’t mix them with request syntax. I couldn’t find an efficient way to do this directly in Google Sheets though. So, I asked a colleague for help and he wrote a script to bypass these obstacles. This new information on how to research keywords is the most valuable that I have ever read. Very reasonable and wanted to try it. Question is, can this method be used for other languages than English? As tools are used, common patterns (informational, etc. ), term modifiers etc .. Sorry if my question you think is not very good because I was just learning about this. Hey Cara – Thanks for reading, glad you found it useful. To answer your question – yes; the concept of identifying language patterns between terms as well as term modifiers that when used change the search intent of the query are applicable to every language. The key to SEO is to select the right keywords that would drive targeted traffic to your website. The idea is to obtain visitors who are a lot more likely to become persuaded to …. keywordmultiplier.net is with us no more. Time to update the post I guess. Anyways, great post. Thanks for sharing great techniques for keyword research it’s really helpful for me. The SEMrush Snippet doesn’t appear to be showing correctly in the post. Hey Tamra – Which one? The api snippet for pulling SEMrush volume data into the google sheet. So, for a few hundred dollars a month, I can get access to large amounts of data?! I still don’t understand why no one has built a Sheets Script, yet, for the Adwords API. nick thats nice article and informative with explanation how to research keywords and use it…. The informations are wonderful. Probably the best article on keyword research I have gone through. Thanks for the resources. I think the issue with keyword research tools is they are never 100% accurate. I know someone who was getting 30k visits a month on his blog (using Google Analytics and Google Search Console), but SEMRush hardly showed any search volume. The other thing is keyword research is always an ongoing process. In 6-12 months time you will have new search terms that people are typing into Google. is the your new keyword research course an update to the previous? Hey John – I don’t have a new keyword research course? Kudos to you for writing such an informative article on keyword research. The most important part of this article for me is search intent, as it also assists in choosing the right keyword and then match it with keyword tools to get additional info. I don’t mind paying for data, but is there an alternative to using the semrush API? It costs $399, and I literally don’t have that right now. I appreciate that in countries like the US and UK, for example, running processes like this work a charm. On top of that, running processes like this on common industries is also fantastic. However, we find that in Africa and the Middle East, applications like SEMRush, Ahfres (you name it) have incredibly limited data, if any. So, if you’re not doing keyword research in a major country or within a common industry, the ability to follow these processes becomes impossible, unfortunately. I’d love to hear how you’d go about doing keyword research outside of “easy” countries and “easy” topics, if I can put it like that. Am I understanding you correctly? Are you saying that Google is now back to allowing FREE use of the Awords Keyword Planner? And also, your thoughts on Keyword Keg? Fabio – Thanks! Have you tried tools that have support for Spanish and Portuguese such as SEMRush and Ahrefs? Nick, this is amazing. Thanks for your detailed post. A bit went over my head, so I will be re-reading it. I can’t wait to gain access to some of these free and paid tools when I get another content marketing job. Nick, this guide was worth to read. I am using SEMRush since 3 years, and yes its really worth to use it. But can you please suggest some better alternatives, if I am willing to conduct Keywords Research for German, French, Spanish and Polish Keywords. I also used Ahrefs, probably it has more Keywords database then SEMRush. But still my vote goes for SEMRush, as it’s developing more & more. Thanks a lot for sharing this article. It covers every details and the tools useful for keyword research. I am using Ad words Keyword Planner from almost a year now. I can say that I have learned some new tricks which I was unaware of. I am going to try keyword research your way. Thanks and keep up the good work. I haven’t got the skills to use these tools and wants to focus on driving my business. Do you have a business that can analyse my web application and give me the focus keywords that will drive traffic to my website and increase conversion rate. If so, kindly send me your requirements. Thanks for this wonderful information. What is the difference between this process and the one explained in your Master Keyword Research Course? I have learned many things, it’s a good blog post that helps me how to optimize an image for a search engine. Thank you, sir, for your blog post. All technique is most important to me. I have taken summery which is very needed to increase SEO. Thank you, sir, and I request to you. your welcome to my side, please visit my website. The post of a search engine (SEO) is most important to me. I can be learned many things and I can apply it’s smoothly all credit goes to your post. thank you, sir, for your informative post. Hello is your course called Master Keyword Research text or videos? This is one of the great articles on Keyword research that I have encountered. However, To add more to this, I just wanna point out a tool (LSI Graph) for an outstanding long tail & semantic keyword research. What do you think about it? Informative post thank you for this post.